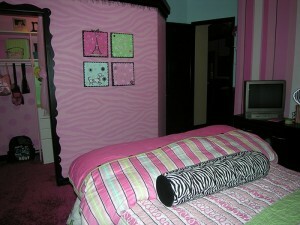 Is your daughter starting to get uncomfortable because of the awful look of her bedroom? Then, maybe it’s time for you to do some changes with your home decorations inside your little girl’s personal space. The first thing you need to do is to clear the bedroom and the closet inside it. Make sure you patch up holes if there are any. You can do the patching with spackle and a putty knife. The next step is to tape and paint the room and its ceiling. Choose a neutral color for the room. The ceiling on the other hand should be painted with the same color that’s two shades lighter than the one that was used for the room. Paint the closet as well. Next, position the bed of the room sideways near the focal wall. Add an area rug underneath the bed. Position it far enough for the legs of the bed to be able to hold the rug in place. Choose a rug with a color that works well with the paint of the room’s walls as well as with the color of the bed sheets of the bed. Using an accent color in the rug is also good to use so that you can add color around the room through pillows and other accessories. After this, you can paint the headboard and footboard of the bed with the color of the wall and the ceiling if you want to. Add a mirror inside the room. This is a vital ingredient that any teenage girl’s room should have. If you have other furniture pieces inside the bedroom, make sure that you even them out so that you can allow for walking pathways especially around the bed. Lastly, if you want to add a modern touch to the room, a hanging chair for girls rooms is something you can consider using.